looking at the hands and differences can you say they are left or right handed. my guess is they are left handed. The developed Mars mounts on the right hands make it look like they use this hand for things that require a good hand grip. If you can trace the ridges from main line A, then usually the one that is lower in the hand is the non-dominant hand. Twins can often be mirrors of each other. In the images I uploaded, the twin on the right looks more likely to be left handed if either of them are in fact left handed. I think they are right handed. Very unique observation i do have seen main line deviation in both hand (like one higher and one lower) but not in a sense of categorizing left and right hand. i thought that based on fingerprints and palmar prints we can differntiaite which made me think they should be left hnaded. yes mainline would make a better way in categorzing when differences in prints are almost same. By the way, I cannot see any interdigital whorls. Yes Patti, that is also my observation so far - some appear to show a characteristic that could explain Boaz's association with a whorl... but formally I think none of those 'loops of humor' can be qualified as a whorl. PS. I am not impressed by 9 palmar triradii... I would prefer to describe that as 'within the range of normal'. Because most hands have at least 6 5 palmar triradii, and any hand with three loops under the fingers + one additional loop on the thenar or hypothenar would be featured with 9 palmar triradi (just like in the case of a whorl on the hypothenar combined with 2 loops under the fingers... and there are quite a few more combinations that have the same result). So, my thought is that 9 palmar triradii should better not be recognized as 'unusual'. PS. I am not impressed by 9 palmar triradii... I would prefer to describe that as 'within the range of normal'. Because most hands have 6 palmar triradii, and any hand with three loops under the fingers + one additional loop on the thenar or hypothenar would be featured with 9 palmar triradi (just like in the case of a whorl on the hypothenar combined with 2 loops under the fingers... and there are quite a few more combinations that have the same result). Not considering the fingerprints, just the palms, A typical minimum would be 3 triradii under the fingers - includes a Missing C pattern, and another triradius on the hypothenar or near the wrist. That would be a minimum and still normal range of triradii and that would be 4. Accessory triradii are not always present with interdigital loops. Also, it really isn't common to see interdigital patterns between each of the 5 digits. And surprisingly all of them have separate start of major lines- Head and Life Line. But there is a little difference in latitudinal degrees of the Head Lines. Latitudinal degrees show mental capacities and potentialities. Accordingly, the sister wearing ring with blue stone has more potentialities, near to genius and is talented. The Head Line in fact qualifying as Hal 9000 there on her palm. A Gift sign indeed. Good hands, good clear pictures and good job done Boaz. ! Yes Patti, 4 is where the 'normal' range starts ... but it is hard to say where it ends. 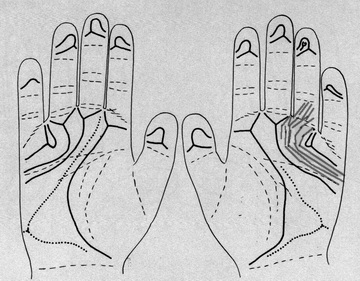 All I can say is that 6 5 palmar triradii is typical for a human hand (6 5 = one triradius for each finger), but I would consider 9 palmar triradii as still belonging to the category of 'normal/common variations' - though maybe we disagree about what is 'normal' and what is not...? My estimate would be that it can be found in about 5% tot 10% in most populations, and therefore I would not describe it as 'special' nor 'unusual'.... but I think 10 or 11 palmar triradii is really much more rare! Yes Patti, 4 is where the 'normal' range starts ... but it is hard to say where it ends. 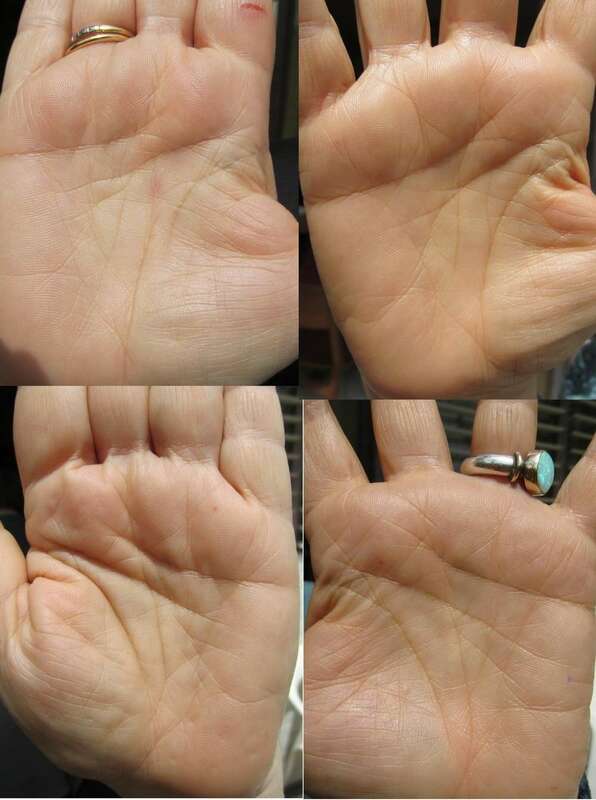 All I can say is that 6 palmar triradii is typical for a human hand (6 = one triradius for each finger + 1), but I would consider 9 palmar triradii as still belonging to the category of 'normal/common variations' - though maybe we disagree about what is 'normal' and what is not...? Isn't it one triradius for every loop plus 1? Because obviously if there can be 4 triradii in the hand and 5 digits - the theory of 6 is incorrect. A hand with all arch fingerprints and a missing C can still be only 4 triradii and have all five digits. I would then see 4 as common as probably a missing C is found in a hand. EDIT:(Cummins & Midlo .2% in right and .6% in left) I think average would be 5 and 6 triradii per palm. Anything more than 6 or 7 would indicate a higher number of patterns and divisions of fields in the palms. No Patti, that's not correct - the typical human palm usually has 6 5 palmar triradii + 1 palmar loop. L = no. palmar loops. PS. I have no idea why you assumed: 'one triradius for every loop plus 1', but it looks like you tried to count the loops on the fingers... without counting the triradii on those fingers. But if you had counted the triradii on the fingers as well then Penrose's forumula would work as well (asuming that a whorl needs to be counted for 2 loops, etc)! Patti, sounds like we agree that 4 palmar triradii can be described as 'common'. However, I am sorry again... you also got confused in the terminology used by Cummins & Midlo ... because you just reported the percentages for the the condition closely allied to the abortive state (= X) where 'the line recurves distally to sue with itself or with a digit radiant' (= x) - see page 111 & 112 in Cummins & Midlo; the percentages for 'x' are 0.2% for the right hand and 0.6% for the left hand (see table 5 on page 111 in Cummins & Midlo). Actually... these percentages indirectly confirm the validity of my point, since these percentages are of comparable size to the percentages that I have given in my earlier post for 9 palmar triradii. This shows that 4 palmar triradii are probably likewise common as 9 palmar triradii... and for this STATISTICAL reason I consider both as belonging to the category of 'normal variations'. Regarding using x or X, I followed the guidelines on page 91 regarding Abortive Main LInes. My interpretation was the Tented Arch pattern is X as the radiant can be traced for a short distance and with x there is "no main line at all". EDIT: Ok, I now see that the missing C is labeled as "o" with the percentages you mentioned. When 95% of people do not have a configuration, I would consider the other 4 to 6 % that do as not so common. Cummins and Midlo put the normal/average percentages in bold. These are not in bold. I've looked through many hand prints looking for the triradius under each of the 4 fingers without a loop. Interestingly, apparently if there is a triradius under each finger, the flow of main lines forces a loop either between little and ring or ring and middle. This probably has something to do with the logic behind the formula, as from there it's obvious with each additional loop there is an additional triradius. That's why triradii plus one is digits plus loops. Because 5 digits with the 5 triradii (including axial triradius) force an interdigital loop. Missing C is resulting in the 4 triradii (as example), results in no loops. 4 + 1 = 5 + 0. Or it changes the rules for a loop to a pattern that can straddle a triradius for Penrose's mathematical purposes. To return to the subject here, I'm going to agree to disagree about having 9 triradii in a palm being common or not. Penrose's formula may not work in every case. "Because most hands have at least 6 palmar triradii..."
I should have mentioned the number 5 instead of 6. So maybe I created myself some part of your confusion about what I wrote? Does this solve your problem? PS. Regarding your 'theory of 6'... I am not familiar with this vocabulary, but maybe you were refering to the stereotype of 5 triradii + 1 loop (which is typical for the human hand)? Though I would now not be surprized that after I corrected my mistake you would now prefer to continue talking about the 'theory of 5'...??? Yes Patti, don't worry... I think your approach should work just fine! Patti wrote: Regarding using x or X, I followed the guidelines on page 91 regarding Abortive Main LInes. My interpretation was the Tented Arch pattern is X as the radiant can be traced for a short distance and with x there is "no main line at all". EDIT: Ok, I now see that the missing C is labeled as "o" with the percentages you mentioned. When 95% of people do not have a configuration, I would consider the other 4 to 6 % that do as not so common. Cummins and Midlo put the normal/average percentages in bold. These are not in bold. "In the degree of least development, there is, practically speaking no main line at all, though the triradius is present. This condition is formulated x, regardless of the line involved." In this passage the words 'no main line at all' does not suggest that there is no triradius present. Since you associated the x with a 'missing c'... I think you probably associated those words 'no main line at all' with 'missing c'. Though the second part of the same sentence should have made the bells ringing (underlined above). "Lack of the triradius, and necessarily of the corresponding main line, is formulated by the symbol O, ..."
PS. Regarding, the 'bold' figures... those only relate to the 'preponderant terminations' (see the header of the table) - but since one of the bold percentages says '3.4' in table 5... I think it is obvious that the absolute size of the individual numbers is not directly involved in those 'bold' labels. It is actually quite hard to understand what Cummins & Midlo exactly meant to say by labeling some of the numbers in 'bold'... because in table 5 they have written the numbers regarding condition 5' for Line B in 'bold' (R: 3.4; L:10.9)... however, regarding condition 5'' for Line A they have not labelled in 'bold' (R:11.6; L:4.8) - even while those last numbers are higher!??? So those 'bold' numbers do not relate to hard statistics, nor to 'normal/average percentages' (your words)... because the labels are inconsistent with the numbers. I think the bold labels probably reflect some of Cummins & Midlo's more extended experience - beyond the German sample involved in those statistics. But your 'unusual' examples can acutally be understood much further... with the help of Penrose's formula - but it requires here a little bit of 'thinking outside the box'. Because, regarding the cerebral case one could wonder: how on earth can such a pattern evolve...? Because at first sight it appears to violate one of the 'natural' rules. Triradius b and triradius c probably fused together into one triradius, and therefore if we had been confronted with a handprint... my attention would become focussed on the features of the triradius under the middle finger! So, if one would find features in that hand which indicate that there is a fusion of triradii... Penrose's formula would work just fine... because one can use the concept of a 'virtual triradius'! And the same is true for your 'tended arch under the ring finger' example. Because one can wonder again: how on earth can an 'abortive state' main line evolve? The answer then becomes: because the ridge line does not end between the fingers... it ends in itself, resulting in an infinitely small loop - that is no longer present: the main line has sort of 'fused'(!) with itself! So, in those cases of an 'abortive state' main line one can count those as a 'virtual loop'. The only problematic aspect of my 'thinking out of the box' here is ... that proper use of these 'virtual' elements probably require some understanding of how the dermatoglyphic elements evolved from the perspective of the volar pads.... plus maybe a little bit of imagination! PS. The alternative (more simple) explanation in a nut shell would be to say: that Penrose's formula usually works just fine... though in rare cases Penrose's formula may not 'appear' to work due to the tendency that triradii sometimes tend to 'fuse' with other triradii (and main line can sometimes 'fuse' with itself). Yes my use of the 'theory of 6' was a direct response to your post and I thought you were subconsciously using the formula to come to the number 6 by adding the 'plus 1' to the natural number of digits. what about the triradii under the index finger, the main line from that does not form a loop. it usually runs accross mars mount or slopes down to the moon mount or can loop to mercury ( i guess there is paper which addresses saying there is a possbility which cummins had speculated that it can loop to mercury). does The formula L+D -1 consider L for loops flowing from saturn to mercury finger or is it part of D-1. Tracing main line A from under the index all the way over to under the little finger would not result in an "interdigital loop" or really any kind of a loop. Main line A can 'flow' to the area around the little finger, but it isn't common. You'll need to describe your newly presented formula of "L+D -1"
Regarding the example with the 'missing C' I don't think a fused B/C triradius would explain the situation. There wouldn't have been the ending where they located it for main line B (if so, your description plus their sketch would lead to a quadradius) The vertical nature of the other main lines imply that maybe the ridges flow from the ring finger down into the palm with vertical ridges from each side. This would be two fields meeting and expanding rather than the three formed by a triradius. Just another outside the box thought. 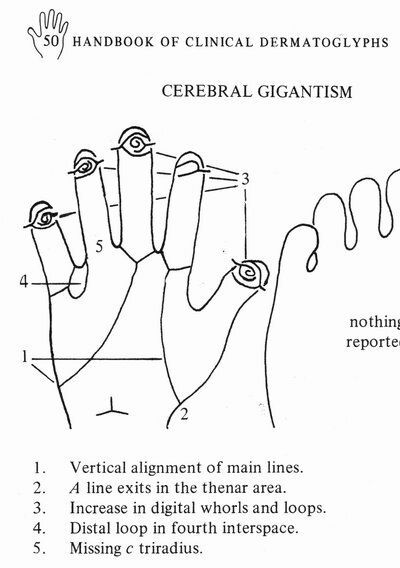 From Penrose's "Dermatoglyphics and Medicine" - an example like above only with the ring finger triradius. I drew onto the one on the right what I'm describing. Creative thinking regarding the tented arch, but an abortive line does not end in an infinite small loop. It would have to bend one direction or the other. The abortive line is likely forming a 90 degree angle with the ridge that aborts it. Hi Boaz, I thought of starting a new discussion, but I still think this is relevant to your topic as we're discussing the logic and formulas for triradii in the palms and I still think that from my experience, I don't often see so many triradii as these sisters have. I'm all for the inquiry, otherwise how could the interesting comments have been made to start with? I had mentioned earlier in this forum about the formula L+D-1 it is penrose who formulated it. My question is does D-1 triiraddi encpoasses the loop between saturn and mecury, iam not sure what main line would u categorize it. Why was the formula by penrose for triraddi designed for palm alone why did he not take into account for fingerprints, this was question whicc i had asked long back in this forum on total number of triraddii for which martijn had mentioned about study about autism ect which he was doing research. Is there any reason why palmar tridaii is treated seperately, is there any evolutionary logic behind it. Is this a second formula by Penrose or are you switching around the T + 1 = D + L? (and your formula doesn't tell us what the "L+D-1" relates to, I'm suspecting T.
Therefore I am unsure what a "D-1 triradii" is. You shouldn't describe the flow of the ridges under the fingers as "looping" because it is confusing when we are describing interdigital loops. A 'loop' is not described as the pattern made in the flow of ridges from the middle finger and the little finger. A loop must be interdigitally. I think it was Penrose who applied one triradius for each loop and a whorl was two loops in the fingerprints. I meant T ( I thought it was obvious in this discussion so i ommitted), no i remember reading T = L+D-1 as penrose forumla. i have to see where i read. Okay i meant flow of ridges as loops, why isn't a loop that it also ends in a triraddi point. How is that interdigitals are different. You havent answered to my question on why penrose choose the forumla to represent palms alone but not fingers.